Cult indoctrination seemed to be the trendy demon scourge out to nab your children in the late 80s and early 90s. Dubbed ‘Satanic Panic’, groups like David Koresh’s Branch Davidians and early mentions of Heaven’s Gate as well as other cult groups seemed to be part of the daily news diet of the day. To protect the innocent there was also a rise in protective groups, articles, information and books. 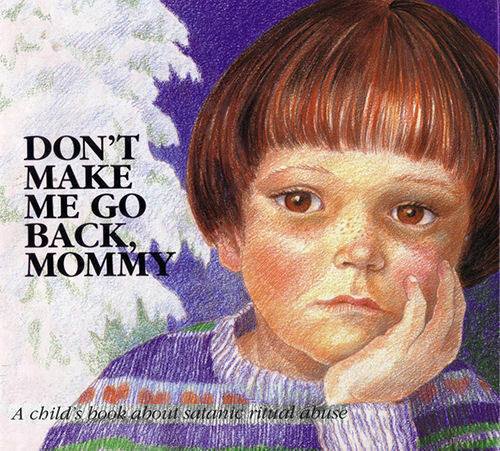 One of those books is called “Don’t Make Me Go Back, Mommy” written by Doris Sanford and illustrated by Graci Evans. And it’s the most terrifying children’s book you’ll ever read. It’s not just the words that’ll make you stare at this thing with wide-eyed horror. The illustrations like the one with the child lying next to a dead rabbit will probably become the groundwork for your future nightmares. You might want to mentally floss with some Curious George or Clifford the Big Red Dog after reading this.